Not one other traveler we met had Belize’s Community Baboon Sanctuary (CBS) on their itinerary. Most had never heard of it, which is a shame because it is definitely within the top three things we did in Central America. Tikal gets all the attention. Savvy travelers know that ATM Cave is a must do, but CBS should also make any list of top sights both because of the sanctuary’s awesome work and the unique opportunity to have an up-close encounter with wild and endangered black howler monkeys. 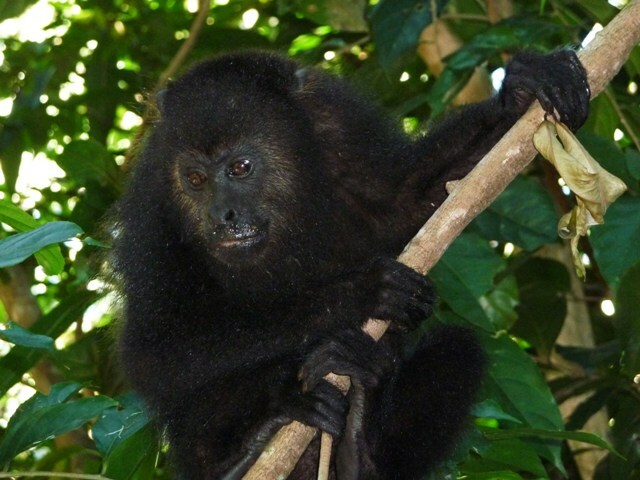 In 1985, 12 private landowners banded together to preserve their property as a sanctuary for black howler monkeys (called “baboons” in the local Creole dialect). Over the years, CBS has grown to over 200 landowners, in seven villages, who have voluntarily dedicated their 20 square miles of land to arrest the habitat destruction that, left unchecked, will cause an estimated 60% population decline over the next three decades. Meanwhile, the “baboon” population at the sanctuary has tripled in size to over 2,000 monkeys. CBS is considered the first conservation effort in the world to rely exclusively on local community cooperation to protect an endangered species. Local landowners benefit directly from the ecotourism revenues generated by the sanctuary creating a win-win scenario for both man and beast. We’re happy to have lent a hand in the continuation of this good work, and delighted to meet the furry residents in the bargain. Nothing Better than Monkeying Around – ha! Have a Great Weekend!